Hey everyone, Buck from RedLynx here! I’m here to bring you another Developer Update and give you some info for the week! Welcome to another exciting week, this one is all about the ADVENTURE! Our Challenge Mode for this week has now started, and it will be an Adventure Challenge to match our theme. All Adventure characters will have increased stats! They will have their health and damage boosted by about 30%, so be sure to remember that as you build your deck! Team Wars is also ongoing, so make sure to collect your Bottle Caps and upgrade your cards before the battle days! We’ve had a few 24-hour events already this week, featuring Sheriff Cartman and Stan of Many Moons. Today we’re featuring Hookhand Clyde and tomorrow will be Swordsman Garrison. Of course, we’ll also have an Adventure themed weekend event. 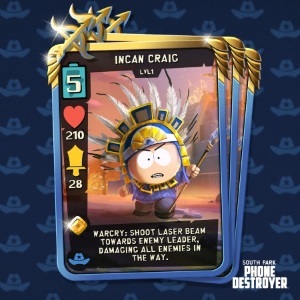 This week will be featuring Incan Craig and will be a card use event. Complete the event for a chance at the Legendary Incan Craig! Don’t forget, the chance at the 2x Lockers WILL be active during this event (with the exception of PvP Tickets)! We're also hard at work on our next big update, which is currently scheduled for April. I don't have any major details to give just yet, but expect more information in the next couple of weeks! Is server side a part of the April update? Now that there is an Incan focused event, can we PLEASE make it known that ne needs a MASSIVE buff? He's considered to be the worst legend and now with Mystic, Fantasy, and Neutral having three legends each as well, Adventure looks really bad in comparison by having SOMM being the only star there, Inuit is pretty good (at 3 cost he'd be great) but Incan just drags them down. Not to mention Sci-Fi needs its third legend to balance things out. Incan needs a major increase in ATK, HP, his unit damage (excluding leader damage since its fine IMO or even decrease it if it means the other stats are increased in result of it) and slightly longer range if he's gonna cost 5. At least SOMM caliber unit damage in his war cry if its only in a front line, since SOMM does much more damage but costs less, it's board wide and can do it multiple times since its charged. Or have it reduced to 4 cost and only a slight increase in stats. What a great update. I'm sure there's nothing better than a full week of the same theme, with basically the same cards all week. A chance at Incan Craig sounds great, I'm sure its a high chance even if I'm not in legendary. This big update coming sounds interesting, a ton of bug fixes and a highly requested new feature, plus a balance change that everyone will love. And I'm sure streams will be back very soon. Thanks for making such a great game. This is a great question! With so much riding on server side (and it being publicised so highly a year ago), it would be nice to know if it is still an active effort, with an anticipated release date? Or did RL relaize people will continue spending on the broken version of the game and are no longer pursuing the switch, to increase that bottom line? Is 2x pvp tickets fix a part of april update ? If not, it would be great to just put it back with the visual bug so we could get those extra tickets pretty please.. Please nerf Many Moons. He's extremely OP especially when combined with Pope Timmy and opponent is able to play him back to back to back. Also if Pope Timmy brings back a card that card shouldn't be in their hand so quickly after the ghost version dies. There's nothing you can do against back to back(pope Timmy) to back to back (Pope Timmy)to back Stan of Many Moons. I've had this happen to me multiple times. I would like to see the "chance of a legendary" go to a "guaranteed legendary" upon completion. I don't mind putting in the extra work for a legendary. Maybe the completion totals can be upped for the weekend so we can get a guaranteed copy of Incan Craig. I've been playing this game since the beginning and not once have received a legendary during an event where there was a "chance".